For seven years Elaine Lustig Cohen was married to Alvin Lustig, one of the most influential graphic designers in the modernist vanguard. Following his death in 1955, she began her own independent design practice, drawing lessons from Alvin Lustig’s achievements while developing her own voice. Elaine and Alvin Lustig, Lustig Office, Los Angeles, 1949. In her covers for Meridian Books and New Directions, designed from 1955 through 1961, Elaine Lustig Cohen used abstract structural elements, expressive typography, and conceptual photographs to interpret the books’ contents. Working at a time when most book covers employed literal pictorial illustrations, Cohen visualized titles in contemporary literature and philosophy through a rich variety of approaches, from stark abstractions and concept-driven solutions to obtuse evocations that bring to mind the recent work of Chip Kidd and Barbara de Wild for Knopf. Cohen visualized titles in contemporary literature and philosophy through a rich variety of approaches, from stark abstractions and concept-driven solutions to obtuse evocations that bring to mind the recent work of Chip Kidd and Barbara de Wild. Elaine Lustig Cohen’s cover for the journal The Noble Savage 4 (1960) features a time-worn classical statue festooned with a typographic moustache and blasted with a star-burst pull-out quote from Darwin. For Yvor Winter‘s On Modern Poets (1959), Cohen photographed a loose arrangement of plastic letters, while she used a field of pebbles to obliquely represent The Varieties of History (1957). If such solutions are suggestively poetic, Cohen could also be brilliantly blunt, as in her choice of oversized, cello-wrapped bonbons for Tennessee Williams’s Hard Candy (1959). Cohen’s institutional clients included General Motors, the Jewish Museum, and the Museum of Modern Art in Rio de Janiero. A pioneer in the field of environmental graphic design, Cohen collaborated with Philip Johnson, Richard Meier, Eero Saarinen and other leading architects of the period, designing signs and printed materials that reflected the spirit of the architecture. Her signs for the Kline Geology Laboratory (1965) used polished granite to reflect the austere architectural setting designed by Philip Johnson. Beginning in 1963 Cohen created created a visual identity for the Jewish Museum, an institution that was at the heart of New York’s progressive art scene at the time. Cohen used a consistent square format for the museum’s catalogs, but allowed the covers to reflect the diversity of its programs, which ranged from scholarly explorations of the Bible to avant-garde happenings staged by performance artist Yves Klein. Jewish Museum Catalogs, 1963, 1966, 1967. Cohen married Alvin Lustig in 1948. She managed her husband’s studios in California and later in New York, serving as an all-purpose secretary, production assistant, and draftsperson—the “office slave,” as she recalls. Alvin Lustig suffered from chronic diabetes, a condition that led to blindness and then death at age forty. As he lost his eyesight, he increasingly relied on his wife to execute his concepts. Along the way, she learned the art of design from one of its greatest masters. Arthur A. Cohen, publisher of Meridian Books, was her second husband and her second major collaborator, who shared her fascination with the history of avant-garde art and design. 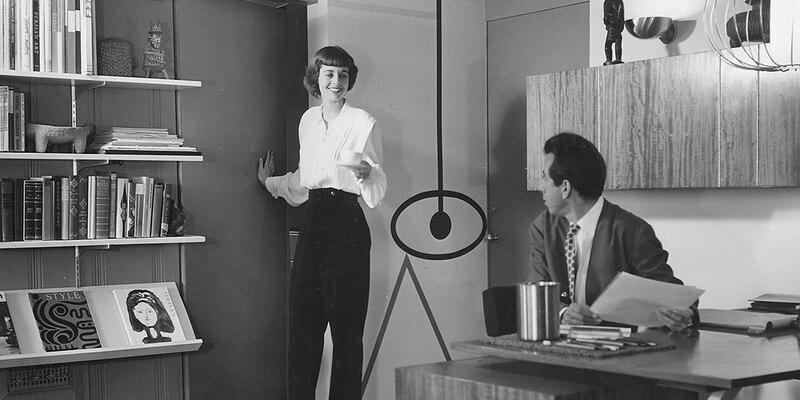 After Alvin Lustig’s death in 1955 Elaine closed his studio and established her own practice. Arthur A. Cohen, publisher of Meridian Books, was her second husband and her second major collaborator, who shared her fascination with the history of avant-garde art and design. In 1973, Arthur and Elaine Cohen established the gallery and book shop Ex Libris, specializing in printed books and ephemera of the European avant-garde. Since then, Elaine Lustig Cohen has worked as a fine artist. A 1995 exhibition of her collages at Julie Saul Gallery in New York reveals her work as a refined commentary on the history of modernist photomontage. Elaine Lustig Cohen donated a collection of her graphic design to Cooper-Hewitt, National National Design Museum in 1993. To celebrate her career as a graphic designer, the National Design Museum organized an exhibition in Spring 1995 featuring over eighty examples of work by Elaine Lustig Cohen, including books, book covers, and institutional graphics. Elaine Lustig Cohen, Modern Graphic Designer. Exhibition curated by Ellen Lupton, Cooper-Hewitt, National Design Museum, 1995. Images courtesy Ellen Lupton. Profile, “Elaine Lustig Cohen, Modern Graphic Designer,” by Ellen Lupton, was originally published in Eye magazine, 1995.